Two different worlds – one unique connection – a whole lot of love. Valentine’s Day – an annual holiday dedicated to love, promoting couples to emphasize their love through gifts and celebration. Makoto Heart spent her life trapped in a dark cell, never knowing the day existed or experienced love until her star knights. When three of her star knights – Kai, Marcus, and Elias – have the opportunity to bring her to Earthala, she’s given the chance to enjoy a four-day countdown to the celebration. Scarlet Sinclair has dreaded February 14th. Her feelings stemmed from the reminder that she usually spent the day sitting alone, binge watching chick flicks on Netflix and devouring chocolate she bought for herself. 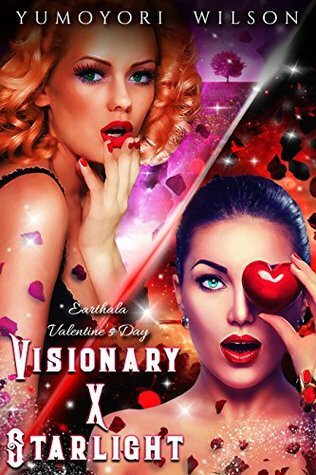 But, this year would be different – Ethan, Junho, and Christian make a promise to prove to her that Valentine’s has more benefits than chocolate, and they’d use the next four days to prove it. Will they each get more love than they bargained for? Recommended for 18+ audience, containing mature sexual content, violence and strong language. THERE WILL BE F/F in this book. If that is not your cup of tea, PLEASE do not read it. Christian groaned while I turned my head, noticing Moonlight sitting on the two-seat sofa— his turquoise eyes staring at Christian. “Please don’t tell me you took his doll again,” I huffed. “I don’t have it,” Christian argued. “Why is Moonlight here then?” I countered. “Cause he loves interrupting me when I want to have some damn alone time with you,” Christian argued. I sighed, patting my thighs. Moonlight hopped off the chair to the floor, making his way to where I sat in Christian’s lap. He leaped onto my lap, sitting patiently as I pet him gently. “Hey you. Why are you interrupting us when Christian doesn’t have your doll?” I cooed, enjoying the feel of Moonlight’s soft black fur. “He hid it, but it’s not here,” Risuki mumbled in my mind. I sighed, turning to Christian who grumbled under his breath. “Junnie has it,” he admitted reluctantly. “Your familiar has a vendetta against me and is trying to ruin the one day I have with my girlfriend before Valentine’s Day and I didn’t want him crashing it, again,” Christian complained. I blushed, feeling touched by his frustration regarding our lack of alone time. “Well, he shouldn’t have hidden it. Could have asked nicely,” Risuki mumbled. Hi loves! Time for another TBR Thursdays! TBR Thursdays is a weekly segment that highlights books, ebooks, and ARCs that I own and have been in my TBR forever. At the end of the year, I’ll do a recap to see how many of these books I actually read. With their country and their hearts divided, Carys and Andreus will discover exactly what each will do to win the crown. How long before suspicion takes hold and the thirst for power leads to the ultimate betrayal. I remember seeing the cover for this and reading the premise and thinking “Whoa…this book sounds so awesome and exciting!” I bought the ebook a few weeks after it was released, but around spring and summer I tend to read YA contemporaries. I put this aside for fall/winter, but as you can tell, I still haven’t gotten to it. Have you read Dividing Eden? What did you think? Let me know in the comments below if I should bump this up on my list. What are some books on your TBR that you decided to put aside to read later on, but ended up forgetting about it? As always, thanks for stopping by and have a lovely day!